Snoop Dogg will feature on Charlie Wilson's next album. The 63-year-old singer, songwriter and producer is preparing for the release of 'In It To Win It' in February 2017 and he has collaborated with a number of stars including Snoop Dogg, Lalah Hathaway and T.I. on the record. Charlie and T.I. will also release a new single, 'I'm Blessed'. He said: "'I'm Blessed' says exactly where I am in my life, blessed to still be making music that people want to hear. 2016 has been a tough year for so many people around the world and I am proud to release a song that reminds us that we can all find some blessings in our lives." 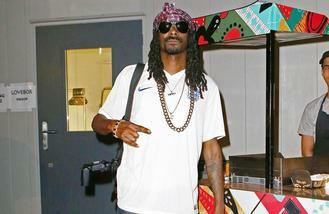 Meanwhile, Snoop recently slammed Kanye West for ranting on stage. The 45-year-old rapper took to social media to slam the 39-year-old musician - who has three-year-old daughter North and 12-month-old son Saint with his wife Kim Kardashian West - for constantly venting about fellow artists. Speaking in a clip, which sees Snoop give a running commentary whilst listening to Kanye's speech in the background, the 'Drop It Like It's Hot' hitmaker said: "This n****r crazy. Have you heard this n****r diss a n****r onstage? This n****r crazier than the s**t I got on my head. "That n****r crazy. I can't believe he's still talking. He picked the wrong night to vent like that, them Sacramento n****rs ain't feeling that s**t.
"He was talking that weird a*s s**t. That's just my thoughts. "I smoke weed. Weed don't make you do that. What the f**k is he on?" Harry Judd told Busted's Matt Willis there is only one song on their new album 'Night Driver' which he skipped. Little Mix singer Jesy Nelson has reportedly started dating a new man, weeks after splitting from her fiance Jake Roche. Justin Bieber has reportedly been indicted in Argentina over a 2013 altercation with a paparazzo. Sia and Sean Paul's 'Cheap Thrills' is MTV's Most Played Music Video of 2016. The Lumineers are donating money made from their cover of 'Blue Christmas' to the environmental charity Cool Earth. Haim have collaborated with former Vampire Weekend member Rostam Batmanglij on their new album. Dua Lipa is "scared" of putting herself out there on her debut album because she wants to come across as "authentic". Melanie Brown has cast serious doubt that the Spice Girls reunion will take place in 2017. Chance the Rapper's "favourite moment" of 2016 was getting to perform a tribute to the late great Muhammad Ali.